We're excited to be working with Belen Ceja as the winemaker for Aldina Vineyards. 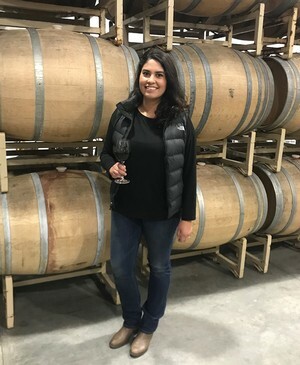 Belen grew up not only surrounded by the flourishing vineyards in Napa and Sonoma Valleys, but also embedded in the wine industry as the daughter of winemaker and owner, Armando Ceja. "My family has been in the wine industry for years. Both of my grandfathers were a part of the Bracero Program (Immigrant Farm Worker Program) in the late 1950's and early 60's. At a young age my dad worked in the vineyards and grew up having a passion for it. As a little girl I was and forever will be a farmer's daughter, walking with my dad though the all stages of the vineyards from pruning, frost, harvest and winemaking," says Belen. Belen learned the skills associated with winemaking at an early age. "When my father had a glass of wine at home or at a restaurant he would swirl his glass then put it up to my nose and I would smell the wine. He would ask or state what he was smelling, and he would show me the color/hue of the wine," recalled Belen. She decided to pursue a career in the wine industry, officially receiving her degree in Enology and Viticulture from Fresno State University. To complement the degree with hands-on experience, she applied for harvest internships. She felt confident in her skills and development when she realized she was the only harvest intern asked to stay on as an employee at Enkidu Wine in 2008. "I fell in love with everything about wine production and winemaking instantly." While she's always in Sonoma County for both work and family, Belen and her husband currently live in Emeryville with their (almost human) pup Balú. We are using estate grown fruit from the Fountaingrove Dristrict AVA. These vineyards are located on top of a mountain with volcanic soils and are optimal conditions for growing Cabernet Sauvignon. Al personally planted Aldina Vineyards on their estate in Santa Rosa. In the early mornings of fall, we walk the vineyards to determine the optimal maturity level by tasting the fruit for the tannin structure and flavors. It is easy to see Al's love and his passion for his vineyard. From a winemaking standpoint, it's great to work with a grower who shares the same passion and excitement of the grapes coming to full maturity as I do when I receive the grapes to make our wines. I am a strong believer that if you have great quality fruit, this will only allow you to elevate the great wines we are making. Our wines are small lots that are handcrafted at the time of harvest using minimalist, traditional and new wine making methods with great oak.